I found no better place than here to post it. So I hope this will get one of the web developers attention. 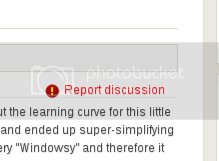 The reason why I post is because of the absolutely horrible and out of place "Report this" signs that are pasted on about all pages of the community part of Linux.com. They're simply a nail in the eye, with a hammer constantly driving it further in. I've used the report to buttons a few times already, as there have been a few trolls posting nonsense on this board. Always a new member with only one post, and many paragraphs of gibberish. It's nice to be able to report abuse easily. Well it's not the replybutton but rather the design of it that I'm pointing at.